oppression, and ended up as refugees on foreign shores. Her two documentaries, Seeds of Hatred (2015) and Bodies for Sale (2016), explored the issues faced by these refugees both in Myanmar and in their new ‘homes’. This year, Mahi – who had worked for Time magazine and AlJazeera – has come out with BOU a documentary that tackles the heart-rending subject of child brides among the Rohingya refugees. “Bou means bride in the Rohingya language,” says Mahi, who took two years to complete the documentary. Unfortunately, a better life is the last thing these young brides will find. 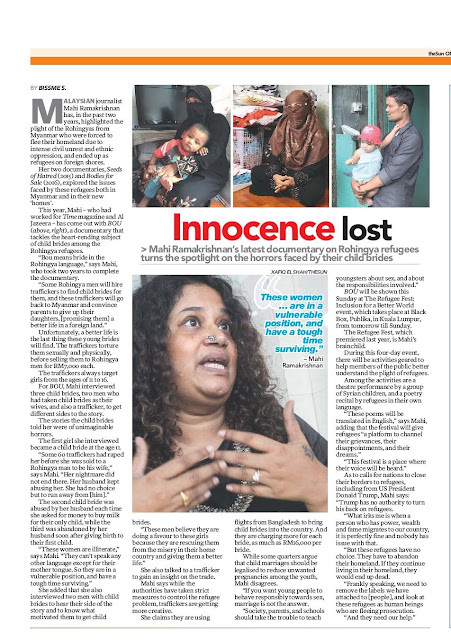 The traffickers torture them sexually and physically, before selling them to Rohingya men for RM7,000 each. The traffickers always target girls from the ages of 11 to 16.
became a child bride at the age 11. The second child bride was abused by her husband each time she asked for money to buy milk for their only child, while the third was abandoned by her husband soon after giving birth to their first child. “These women are illiterate,” says Mahi. She added that she also interviewed two men with child brides to hear their side of the story and to know what motivated them to get child brides. She also talked to a trafficker to gain an insight on the trade. Mahi says while the authorities have taken strict measures to control the refugee problem, traffickers are getting more creative. She claims they are using flights from Bangladesh to bring child brides into the country. And they are charging more for each bride, as much as RM16,000 per bride. While some quarters argue that child marriages should be legalised to reduce unwanted pregnancies among the youth, Mahi disagrees. BOU will be shown this Sunday at The Refugee Fest:Inclusion for a Better Worldevent, which takes place at Black Box, Publika, in Kuala Lumpur, from tomorrow till Sunday. help members of the public better understand the plight of refugees. Among the activities are a theatre performance by a group of Syrian children, and a poetry recital by refugees in their own language. “Trump has no authority to turn his back on refugees. What irks me is when a person who has power, wealth and fame migrates to our country,it is perfectly fine and nobody has issue with that. But these refugees have no choice. They have to abandon their homeland. If they continue living in their homeland, they would end up dead. Frankly speaking, we need to remove the labels we have attached to [people], and look at these refugees as human beings who are fleeing prosecution. And they need our help."